The restaurant has an in-house dry aging room and the meat is cut on premise. 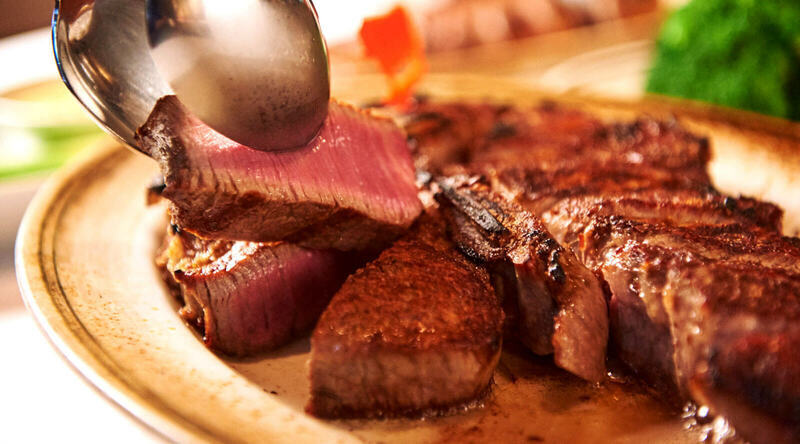 Not only does Wolfgang’s serve phenomenal New York sirloin, rib eye and prime steak (for one, two, three, four or more), it has a rich variety of appetizers and side dishes. Thickly-sliced Sizzling Bacon is an exquisite dish and authentic seafood dishes including lobster and salmon are offered as well. Other highly recommended side dishes include German Potatoes, Creamed Spinach, Garlic Sautéed Spinach, Mashed Potatoes and Lobster Mac and Cheese which extremely go well with steaks. In addition to our grand menu, we offer our voluminous lunch menu including Classic Burger using USDA Prime beef and splendid Steak Sandwich with dry-aged beef. Other than our signature steaks, we also offer various dishes for entrée such as salads, daily special pasta, and fish dishes. Over 1,000 bottles of various wines from around the world are offered. Enjoy the extensive, award winning wine list at Wolfgang’s Steakhouse. * Dinner menu always available.